*Disclaimer: I have no personal bias towards anyone for anything, this is just something I found that I feel should be fixed. After clicking on the listing and looking at the site I didn’t see anything that, in my opinion, put it as a top 10 most relevant result. This got my spider sense tingling because as we know in the businesses if there is nothing fishy going on onsite, there must be something going on offsite. There are many tools that are now available, for a price, that allow us to look into such matters. I ran the site through my top three Opensiteexplorer.org, Linkdiagnosis.com, and Majesticseo.com. I got some very interesting results. As I suspected, there was a major increase in the number of backlinks that were found. This is where Majesticseo.com really shines. It gives you the history of the links and not just a snapshot. And this data correlates well with the information coming from SEMRush, as seen below. Here is where it starts to get interesting, looking at the exact pages that link to the site I noticed that they are all homepages and not internal pages. This is rather interesting. Given that this is an SEO company, they could be footer links, so to make sure I visited a few of the sites where the anchor text was “SEO”. Site after site, ended up with the same results, content spam. These are pages/sites which are just full of different sentences strung together to form long content blocks. Additionally, where they got really clever was instead of having post after post of new content, it was all on the homepage. There were no other real pages, just a homepage full of BS content. Homepages tend to carry more weight, but I am surprised that after the Panda update that these types of links made it through. 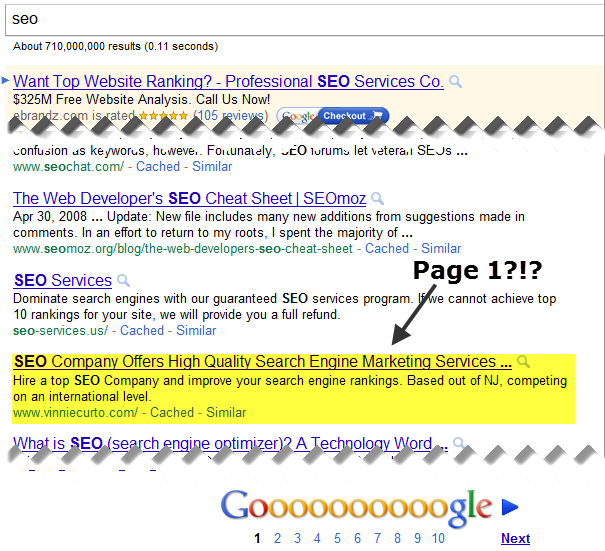 Doing one quick search for a sentence in Google results in multiple sites with duplicate content. 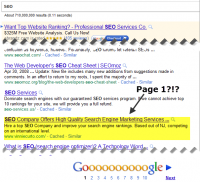 These sites are still indexed and all have the similar one page structure. Okay now that I know where the links are coming from and I have a solid set of websites to look into, I took my time digging into some stats on the websites/domains. 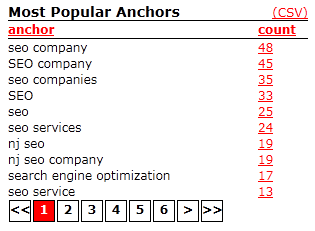 I took a look at the websites whose anchor text was “SEO” which was about 56 different websites. Using this sample the first thing I wanted to know was about was whether they shared IP addresses at all or if there were any similarities. None of the sites shared IP addresses and none of them even shared the same class C address block. This tells me that the person is going through great pains to hide what they are doing. Digging into the whois information I get that some of them or all of them (I hit my cap to look them up) were being hosted through seo-host.com. Also, there were 21,122 domains associated with the email used by seo-host.com. That site allows for this type of hosting with multiple IP addresses spread across the world. Not satisfied, I wanted to dig further. I decided to look up the creation date, last modified date, and ns records. And what I found tells and interesting story. Below is a timeline for the last updated date for each of the 56 websites. As you can see, there are a few dates in which multiple sites were last updated on. Somebody went on a buying spree. Note: Best viewed by changing the zoom date to 1 year. Note: All but two of the domains had the registration information hidden. For the two that I found that did have the info available, they had the same name, but different email address. One was a gmail account and the other was a yahoo.ca account. While I am just a armchair quarterback in this, I think there may need to be a new ranking signal (or two). The signal that may make sense is to look at the last updated dates for the domains and correlate that date to the backlink profile of the site which is getting the link. If there is a lot of overlap as seen above this could rule out a lot of ballot box stuffing. I have not completely thought through all of this since I do not know how all of the signals Google uses interact with each other, nobody does (except a few at Google), but I wanted to throw it out there as a suggestion. Also, I know that the Panda update was designed to address duplicate content from ranking well, but this is a similar form of duplicate content. As for the second signal, which is more an update to a current signal, rengineer the Panda Update algorithm to catch these offending sites. Lastly, if anyone is interested in the data that I have collected please let me know either via the contact form or in the comments below.